Fortunately for explorers of the summit there is a wealth of maps and mapping resources available. Listed here are many different maps that you can use to plot out your excursions. Every effort is made to keep the maps up to date, but things can change quickly in the area so always be prepared for things not quite going according to plan. In order to aid in your excursions on the summit, we have listed below some of the many mapping resources that should help. All of these resources are available via the internet and can be downloaded by you. We truly live in incredible times when it comes to satellite imagery and maps. We are fast approaching a day when we will have real time mapping on our phones. Right now we have static satellite imagery at our fingertips as well as real time GPS. Everyone uses Google Maps but probably not so many use Google Earth. We highly recommend that if you into mapping that you start using this program (it’s available for desktop and phones). We have prepared a couple of custom Google maps that should help you explore the Summit area. For all of us old timers the topo map is an old friend. Unlike satellite imagery, there is much left to interpretation using these maps which can translate into getting off track. 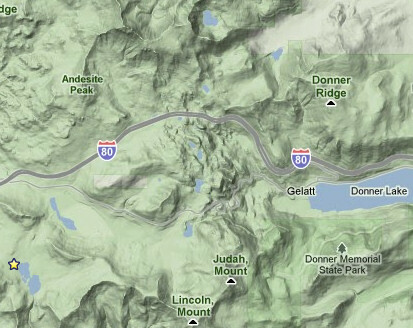 There are two official USGS maps for the Donner Summit area that you can download below. Fortunately the USGS now includes satellite imagery with their topos which can make these new maps very useful. If you are really interested in topo maps you should check out the USGS site as well as the TOPOVIEW website. The US Forest Service has prepared two very useful maps for the Tahoe National Forest. The area map provides standard geographical data. The Trails map is particularly useful for exploring the area. The map has the names of many of the trails in the area as well as common names for the different area. This can help when you’re trying to find a spot and only have a name some local gave you. The Royal Gorge ski trail map can be very useful for summer hiking and mountain biking since most of the trails in the area double as ski trails in the winter. There is a trail system map put out by the Truckee Donner Land Trust on their website that does roughly show the trail system they have set up. Unfortunately the resolution is pretty low. For higher resolution and detail we recommend using the trail descriptions and maps on this site. If you just have to have a map to carry, you will find the Royal Gorge ski trail map should keep you on track. The rich history of the Donner Summit area has resulted in a large collection of historical maps. We would recommend that you visit the Donner Summit Historical Society website to find links to some of these vintage maps.